The upper beaches experience frequent disturbance from extreme high tides and storm surges. They have few plant species, most of which are annuals. Behind the beach are the most active dunes with sandy, unstable, and droughty substrates. The continuous wind and salt spray limit the number of species in this habitat to mostly sea oats (Uniloa paniculata), beach croton (Croton punctatus), bitter seabeach grass (Panicum amarum) and trailing vines (Ipomoea and Strophostyles spp.). 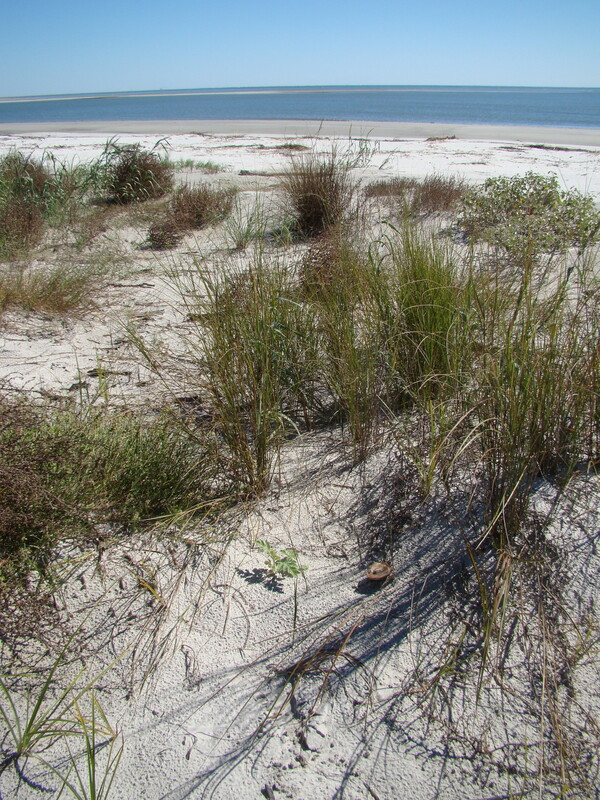 In swales behind primary dunes, the vegetation is dominated by grasses, includings eashore dropseed (Sporobolus virginicus) and saltmeadow cordgrass (Spartina patens), sedges and rushes. Frogfruit (Phyla nodiflora), annual sea pink (Sabatia stellaris) and marsh fimbry (Fimbristylis caroliniana) often grow in large swaths along with a variety of other herbaceous and grass species in secondary swales.The swales support more plant diversity as they retreat from the beach and gain a buffer from salt and also more freshwater due to closer proximity to upland rainwater seepage. Eventually they support a scattering of wax myrtle (Morella cerifera), cabbage palms (Sabal palmetto) and pines (Pinus spp.). The most stabilized and highest dunes support maritime live oak forests, with a canopy of live oak and an understory dominated by saw palmetto. Some of the rarest species on the Island are associated with these dynamic systems, including: loggerhead sea turtles, American oystercatchers, and Wilson’s plover. Bird species’ diversity is high in the dune grasslands. Interdunal swales support a high diversity of butterflies from early spring until winter, while the beaches are important to fall migrating butterfly species using the eastern/Atlantic flyway, including the at risk monarch (Danaus plexippus). While beaches are a common feature on the ocean side of barrier islands along the south Atlantic coast, they are considered vulnerable communities. 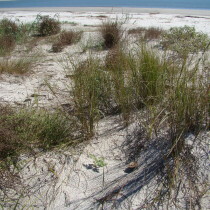 Adjacent development on many barrier islands creates threats from recreation and pets, both of which can disturb nesting shorebirds,trample nests and degrade plant assemblages. St. Catherines and other undeveloped island become all the more important refuge areas for native beach and dune communities. Introduced feral hogs and native raccoons are serious threats to St. Catherines’ few accreting beach systems, especially with the extensive loss of beach habitat due to erosion. Natural tidal and storm surges have accelerated with sea level rise and climate change,reducing the spatial extent of appropriate beach habitat. Reduction in the regional sediment supply—from dams on rivers or harbors deepening, primarily from the Savannah River—also influences the spatial extent of beaches.